(CNN) New climate change records have come along to remind us that Earth's thermostat is steadily pushing upward. More exactly, there are two global high temperature records and a smattering of climate change low points. March 2015 was the warmest March since record-keeping began in 1880, says the National Oceanic and Atmospheric Administration. And the first quarter of 2015 was the warmest first quarter on record in those same 136 years. That gives 2015 a stab at trumping the hottest year on record -- which was 2014. The uninterrupted continuation of the warming trend is no surprise. The 10 warmest years on record have occurred in the past 17 years. And though the rise in the last 10 years has been gentle by comparison, since 1910, the clear trend has been up, according to NASA's Global Land-Ocean Temperature Index. In the latter two thirds of that time, warming and the effects on climate have been epochal, says the Intergovernmental Panel on Climate Change. "Since the 1950s, many of the observed changes are unprecedented over decades to millennia." March 2015 edged past the last record high March, which was in 2010, rising by 0.09 degrees Fahrenheit (0.05 C). Average global land and water temperatures for the first quarter of this year beat the last record first quarter, 2002, by the same margin. Yet another broken record this March was more obvious to the eye. The expanse of Arctic sea ice shrunk to an absolute low for any March on record. 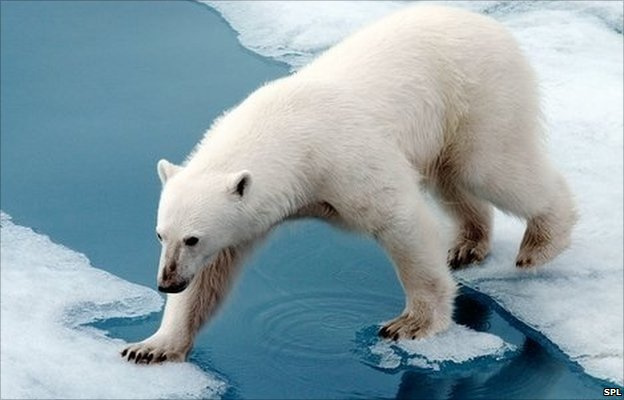 "The average Arctic sea ice extent for March was 430,000 square miles (7.2 percent) below the 1981--2010 average. This was the smallest March extent since records began in 1979," NOAA said. On the other end of the globe -- in the Antarctic -- sea ice has been on the gain, and this year, it hit a record March high. But globally, the overall result is a big net loss. "The upward trend in the Antarctic ... is only about a third of the magnitude of the rapid loss of sea ice in the Arctic Ocean," according to NASA. Natural ice continues disappearing elsewhere. Californians in particular have noticed the lack of snow on their mountain peaks, a major source of their dwindling water supply. The warming trend has reduced snow coverage throughout the Northern hemisphere, especially reducing the amount of coverage in spring. This March, Northern Hemisphere snow coverage was the seventh lowest on record, NOAA said. But all this is nothing compared to what lies ahead, NASA says. What it expects for the not-so-distant future is unprecedented in contemporary weather records, unprecedented in at least the past 1,000 years. If carbon emissions continue on course, further temperature rises should bring decades-long megadroughts to the western half of the United States in this century. Wait. That would be yet another record. This March saw the highest level of greenhouse gases in Earth's atmosphere since record keeping began. Not the highest level for any March but the highest level ever at 400 parts per million, NOAA says. Considering the rising carbon dioxide trend, NASA has run 17 climate models on supercomputers with data spanning the past 1,000 years.